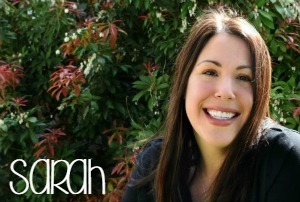 You are here: Home / General Crafts / Learn How to Make Snow Paint for Winter Fun! Learn how to make this 2-ingredient snow paint. It is ridiculously quick to make and the kids just love it! Click for the recipe and some tips for painting. The Ruffles and Rain Boots family lives in Seattle and although we’re in the very far northern US, we rarely ever get snow. This week, however, we’ve been inundated with it! Snow day after snow day, the kiddo and I have been outside just as much as we’ve been in. 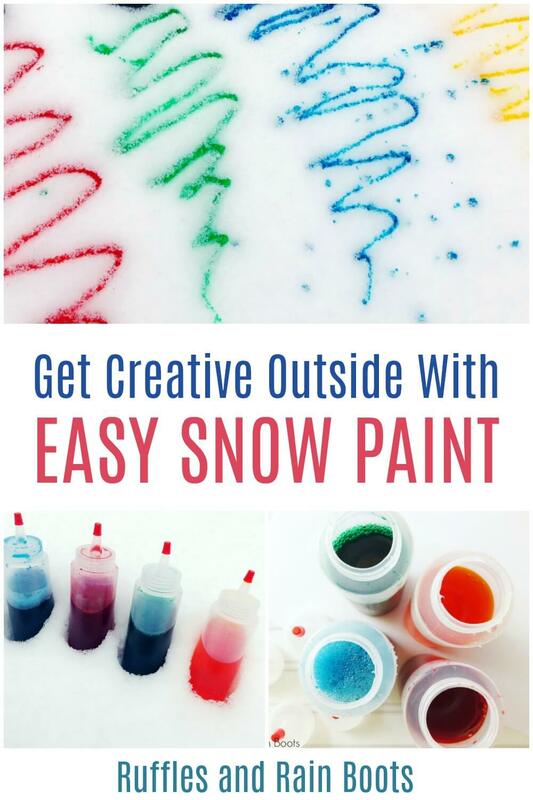 This quick snow paint recipe is a life-saver for the “I’m bored” moans that come when no device in on. 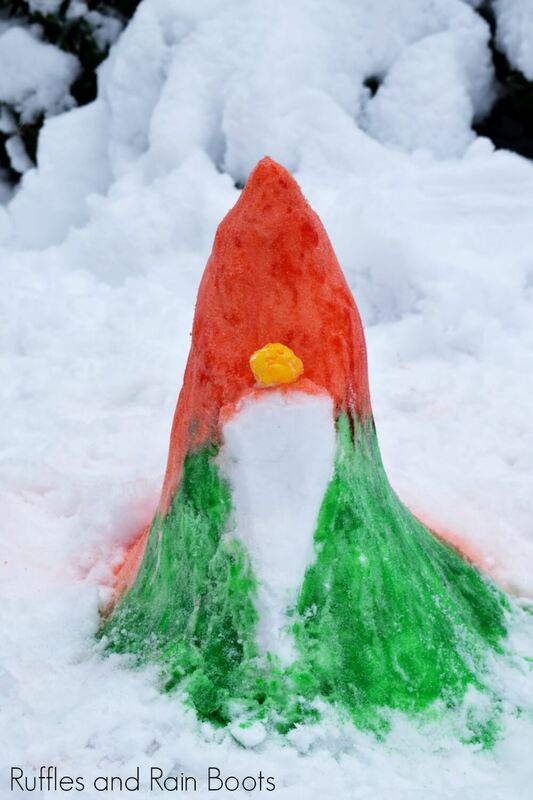 Grab the kids and get into the kitchen for this fun winter snow activity. No Time to Make It Now? Pin This for Later! I know you’re probably scrolling on your phone right now and might want to come back to this. Just pin this for later. It’s such a fun way to enjoy the snow. 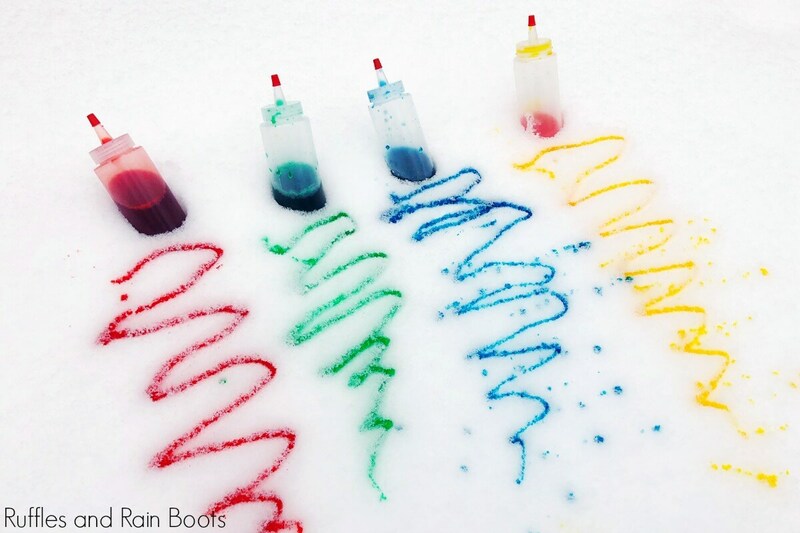 Don’t be shy with the coloring – it’s very easy to make vibrant colors in the snow. When it starts to get low, fill the same container with more water for pastel paint. If you’re building layered objects (like our s-gnome-men), build the lower layer, color, and then build the next. We did it both ways and found this one worked best to avoid mixing colors. Be careful – it can stain clothes, even gloves. 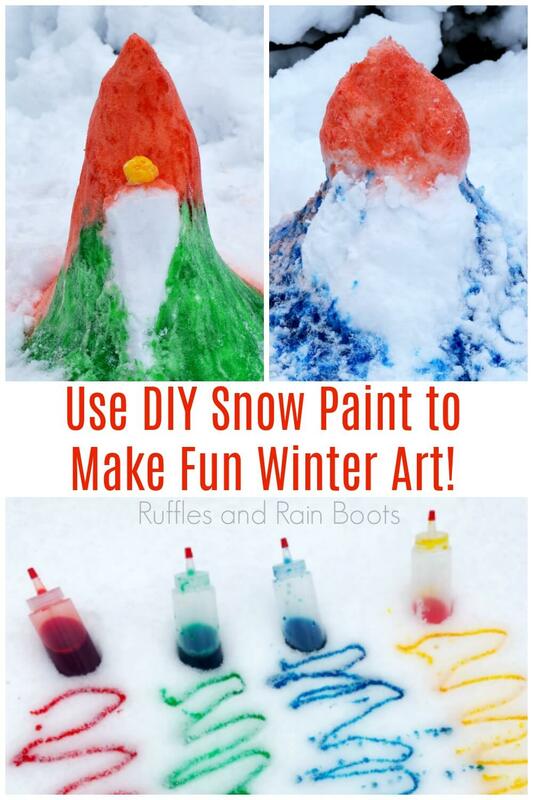 If there is just a little paint left, make a fun color-mixing experiment in the snow. Step 1: Put watercolor into a squeeze bottle. We used a generous amount (maybe 15 drops) so that we could dilute it and make pastels once we’d used most of the bottle. Step 2: Fill the bottle with water and shake to distribute color. Step 3: Get outside and spray some snow!